Today, Congress will likely take up H.R. 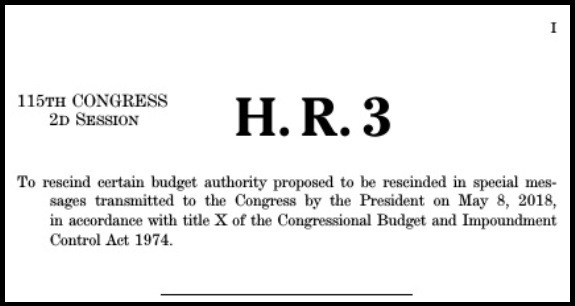 3, the Spending Cuts to Expired and Unnecessary Programs Act, sponsored by House Majority Leader Kevin McCarthy. McCarthy, who has aspirations to succeed Paul Ryan as Speaker, is looking to burnish his credentials with conservatives by carrying the President’s package of budget take-backs. McCarthy’s bill would rescind the $15 billion in unobligated budget authorities from previous years that President Trump requested to Congress in his proposal to rescind funds as provided for under the Congressional Budget and Impoundment Control Act of 1974. Our friend Adam Brandon, of FreedomWorks, says the tool commonly referred to as “rescissions,” was established in the 1974 law and had been used every year, by presidents from both parties, from 1974 through 2000. Over the full quarter-century that the tool was consistently used, nearly $76 billion in rescissions have been proposed. The largest package ever requested was by President Ronald Reagan in 1981, totaling to $15.36 billion. Ultimately, Congress approved 71 percent of the amount requested. Although a rescissions request hasn’t been made in over 17 years, the time is riper than ever right now for conservatives to throw their weight behind any and every tool available to reduce spending says Brandon. In an effort to “build legislative muscle memory” for using the rescissions tool, the White House has requested rescinding funds from past years either for which spending authority has expired, or for which there have been and still are no plans to spend the funds. The White House has said that this package is the first installment in a series of rescissions packages to be crafted and transmitted to Congress. Brandon notes the package sent to Congress from the White House includes only rescissions from past years, not from the 2018 omnibus, addressing precisely the concern that both McConnell and Hoyer outlined. Additionally, it tops Reagan’s request in size, coming in at $15.4 billion. Rescission requests in the package include multiple outdated loan programs that have been untouched since 2011, unobligated balances for retirement programs that expired in 2012, and disease outbreak response funds that have remained untouched since the resolution of the outbreaks. Despite precedent being that someone from leadership introduces the rescissions bill out of courtesy to the president, Leader McConnell has still refused to move on the rescissions package noted Mr. Brandon. Therefore, Sen. Mike Lee together with eight original cosponsors including Sens. Rand Paul (R-Ky.) have taken it upon themselves to introduce the Senate version of the rescissions bill and move forward with the process. This move is laudable says Brandon. The White House has indicated that future rescissions packages will include requests to claw back some of the wasteful spending included in the 2018 omnibus, despite Sen. McConnell’s concerns. In fact, Sen. McConnell voted in 1992 to rescind funds from a spending bill that he voted for earlier that year, so there is no logical reason that he would refuse to do so now on principle. He should instead support the message Republicans run on year after year: cutting spending and practicing fiscal responsibility says Adam Brandon. For these reasons, we join Adam Brandon of FreedomWorks and other conservatives in urging CHQ readers to contact their Representative and Senators TODAY. The toll-free Capitol Switchboard is (1-866-220-0044) we urge CHQ readers and friends to call their Representative and Senators to ask them to support the Spending Cuts to Expired and Unnecessary Programs Act, H.R. 3 and S. 2979.